The team's wide receivers Kenny Stills and Albert Wilson were the first players Sunday to kneel in protest during the regular NFL season. As the country buzzes about Nike’s decision to back former pro-football player Colin Kaepernick and his decision to take a knee during the national anthem, two Miami Dolphins wide receivers became the first NFL players to do so in Week 1 of the season, USA Today and other news organizations are reporting. Kenny Stills and Albert Wilson kneeled during the anthem before Sunday’s game against the Tennessee Titans. While Stills and Wilson knelt, a third player, Dolphins defensive end Robert Quinn, raised a fist. 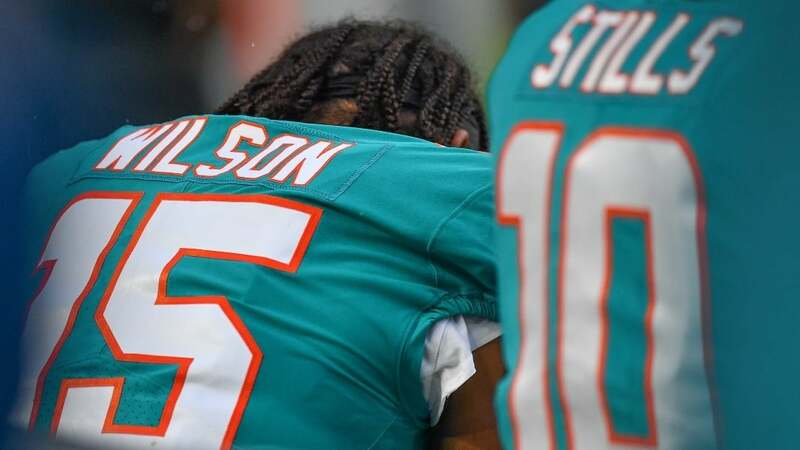 Stills and Wilson also kneeled during the preseason and said they have no plans of changing this, USA Today reported. Stills, however, did say he would reconsider if Kaepernick, a former quarterback for the San Francisco 49ers, and former 49ers safety Eric Reid, were to be signed by a pro team, according to USA Today. Kaepernick and Reid have filed grievances against the NFL. Kaepernick began taking a knee in protest of police misconduct. The NFL remains without a decision or an official stand or policy regarding taking a knee during the anthem – and that is how it will stay, according to Newsweek, citing an ESPN report. The league will not put a new policy in place this season, Newsweek reported. “The new policy is going to be no policy,” Newsweek quoted sports journalist Adam Schefter as saying. Schefter cited anonymous NFL sources.